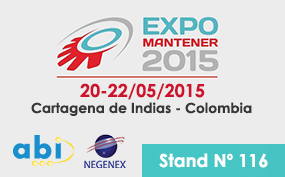 ABI Electronics will be represented at Expomantener 2015, Cartagena de Indias, Colombia - 20-22 May - Stand 116. Expomantener is a space aimed to all those involved in today's economic industrial maintenance, which agglomerates leading providers of products and services in the international market sector. Expomantener brings together more than 1.000 visitors from the guild, and promotes the strengthening of relationships between organizations and industrial maintenance managers, giving visibility to the current situation of the IberoAmerican engineering. Expomantener 2015 will organize Business Meetings, where companies can offer their products and services through scheduled appointments. For a chance to discover ABI's products and to discuss your requirements with our local partner NEGENEX, please visit us at Stand 116.